CDU third year welding students Clayton Johnston from PDQ Enterprises and Adam McMillan from AllMine Pty Ltd.
A major upgrade of Charles Darwin University’s welder test facility will now provide access for all NT companies to improve competency and certify welders against specific national and international standards. In partnership with Incospec, the CDU facility is enabling local welders to test for their advanced welder qualification in the Territory, which in the past has required travel interstate. Developed in partnership with industry partner Incospec, and in consultation with the NT Government, NT local industry and major project owners, including Inpex and Conoco Phillips, the advanced welder testing will support the future demands in weld procedure specification and advanced welder certification. Incospec National Welding Manager John O’Neil said the event had been a great success and showcased how a collaborative effort could advance welder testing in the NT. “Our aim is to make CDU the centre for all VET and advanced based welder training and testing to support the strong future growth of this region,” Mr O’Neil said. CDU Heavy Equipment and Metal Trades team leader Rohan Badenhop congratulated the participants, saying he was exceptionally proud that two current third year welding apprentices had demonstrated strong skills knowledge and application to be able to successfully complete the advanced testing. 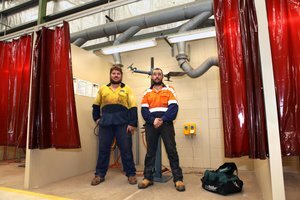 Advanced welder testing and certification programs began formally at CDU for NT industry this month.